Take care of your hair styling woes with ETI Italy's range of versatile professional hair dryers. Get ready to let your hair down. Super-powerful 2500 Watts Professional AC Motor. 2 Temperature settings for quick and fast blow drying. 2 speed settings for quick and fast blow drying. 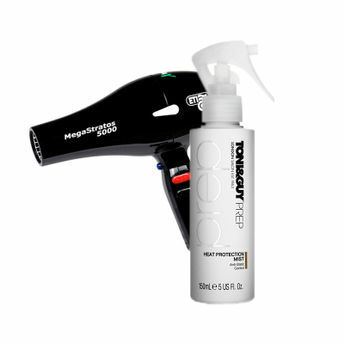 4-combinations of heat and speed for blow-drying versatility. Narrow concentrator for high-heat style setting. Broad concentrator nozzle for high speed professional drying. Real cool shot for hair style setting and firming. Ionic function to reduce frizz and fly away hair (settles the cuticle firmly). Hi-tech Italian Design and Advanced Technology. Premium high-quality polycarbonate body for extreme sturdiness and strength (almost unbreakable). Long life Italian professional AC motor. Heating element with a high precision thermostat. Special patented fan mechanism for an extreme and intense airflow. Long life switches capable of undergoing 50,000 cycles. 3 meters high flexibility professional power cord. One year Warranty in India.